The Greek mythology from the ancient Greeks is filled with various Greek Gods, Goddesses and of course Monsters. The monsters and mythological creatures in the Greek mythology are some of the most vivid and scary in known legend. These creatures are often portrayed in movies and literature in various avatars but few truly understand exactly what these creatures are and their legends. Here is a list of Top Six Most Popular Creatures From Greek Mythology with a brief description of the mythologies that brought these creatures their fame and infamy. 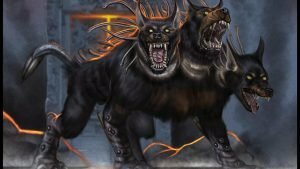 On number six is Hades’ loyal guard dog, Cerberus. This legendary creature has been immortalized by modern media and is well-known for being a massive dog with three heads who is said to be the guard of the entrance to the Underworld. Lore states that this creature was known to have a hunger for living flesh who neared it. It is also said that the three heads represent the past, the present and the future. The mythology regarding Cerberus is that this was the final labor Hercules had to perform to atone for his sins. This labor mentions the Mycenaean king Eurystheus asking Hercules to bring Cerberus back to be presented to the king in the mortal world without using weapons. The hero managed to complete the task by wrestling the hound barehanded and bring it before Eurystheus who was said to be so terrified that he hid in a vase and pleaded with Heracles to return the hound to God of the Underworld, Hades. When we talk about The Sphinx, the first thought that comes up is about the Great Sphinx of Giza in Egypt. However, according to the experts in Greek mythology, The Sphinx was a creature with the body of a lion, the head of a woman and the wings of an eagle that played a major role in what was later known as the legend of Oedipus. The myth regarding the Sphinx talks about how this creature blocked Oedipus who was on his way to Thebes. The Sphinx blocking the road asked Oedipus a riddle, not mentioned in early Greek legend. However, the popular version of this riddle goes so: “What is that which in the morning goeth upon four feet; upon two feet in the afternoon; and in the evening upon three?” To which, Oedipus answered: Man – the creature who crawls on all fours as a child, walks upright on two feet as an adult and walks using a cane in the last stages of life. 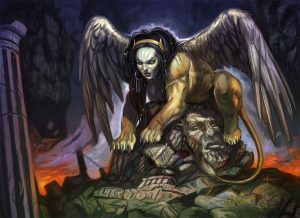 Legend says that the Sphinx devoured itself in anger while other myths state that the creature jumped off a cliff to take its own life in frustration. This was because if Oedipus was wrong in his answer to the riddle, the Sphinx would have devoured him like the many travelers that came before. 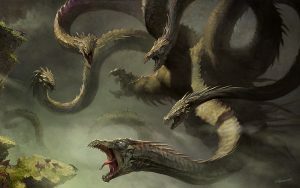 Another well-known and deadly creature from the Greek mythology is the Hydra. This creature is said to be a water monster that looks like a serpent with multiple heads. It was also speculated that the creature was extremely poisonous and lethal to humans. The unique point about this creature that made it the stuff of nightmares is that it was difficult to kill because of its ability to quickly regenerate its decapitated limbs. The Hydra was well-known for it being the second of twelve labors required to be completed by Hercules. This Greek hero was said to have covered his nose and mouth with a cloth to prevent from being poisoned. To kill the Hydra, Hercules was said to have tried using his signature club as well as a sickle before realizing the creature’s ability to regenerate. After encountering this problem, he devised a plan where he could cut off the heads and use a torch to cauterize the wound, stopping the creature from regrowing its heads. By using this method, Hercules was successful in killing the Hydra and completing his second labor. 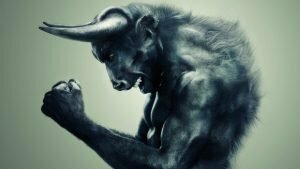 The Minotaur is another popular creature from Greek mythology known for its violence and slaughter. The creature is one described as a grotesque abomination with the head of a bull attached to the body of a man. It is said that it was portrayed as a creature that enjoyed hunting humans and devouring their flesh in the twisted labyrinth it called home. As to how this creature came to its infamy, the story tells of the ruler of Crete, King Minos and his son Androgeus who was killed in Athens, by so say the Athenians who were jealous of his performance in the Panathenaic Games. After the death of Androgeus, King Minos raged war against Athens and wining. After the victory, the king forced the Athenians to send 7 young men and 7 maidens into the labyrinth on the island of Crete to be hundred and devoured by the creature. The young hero Theseus, along with help from King Minos’ own daughter Ariadne, managed to slay the Minotaur while it slept to escape with the other Athenians back to Athens. On number two in our list of the most popular creatures from Greek mythologies is the Cyclops. This name should bring about an image or a giant one-eyed humanoid monster in the minds of most people. In Greek myth, the Cyclops race were primordial giants who were born from Gaia, the first Titan is also known as the Mother Earth. These creatures were said to be very ferocious and posed immense strength who grew so strong and powerful that their own father, Uranus was afraid of them. This is why the cyclops were thrown into the pits of Tartarus. The cyclops were later released from Tartarus by Zeus when the Olympian Gods overthrew Uranus. The most famous story regarding the cyclops includes Odysseus and the cyclops named Polyphemus. In this story of the hero in his travels, Odysseus and his crew get stuck in the cave of Polyphemus who makes them prisoner while devouring they one at a time. The wise hero then devises a plan where he gets the giant drunk and blinds it with a sharpened staff. Odysseus and his crew then harness themselves under the bellies of the sheep of Polyphemus. 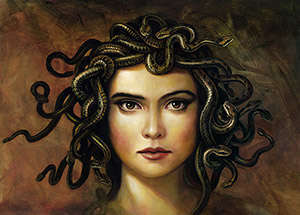 To conclude our list, the most popular creature from Greek mythology is Medusa. This fearsome creature was able to turn into stone, any creature that gazed upon its face. The reason for this is that Medusa was said to have hair that was entirely made up of venomous snakes that could strike fear into mortals and demigods alike. As for the origins of Medusa, it is unclear as there are varying accounts. One tale tells of Medusa being born to Ceto with a hideous face and a serpents tail instead of legs. Another variation as stated in Ovid’s Metamorphoses, Medusa was a beautiful maiden who was raped by the sea god Poseidon, transforming into the monstrous creature she was later known to be. The hero who confronted Medusa was Perseus who used a mirrored shield from Athena to avoid looking directly into Medusa’s face. He used the mirrored shield to kill the creature and take its head which he used against his enemies before presenting it to Athena who attached the head to her shield.